BOSTON, MA -- In less than 24 hours we will turn the page over to December, and the final month of the 2017 calendar year. 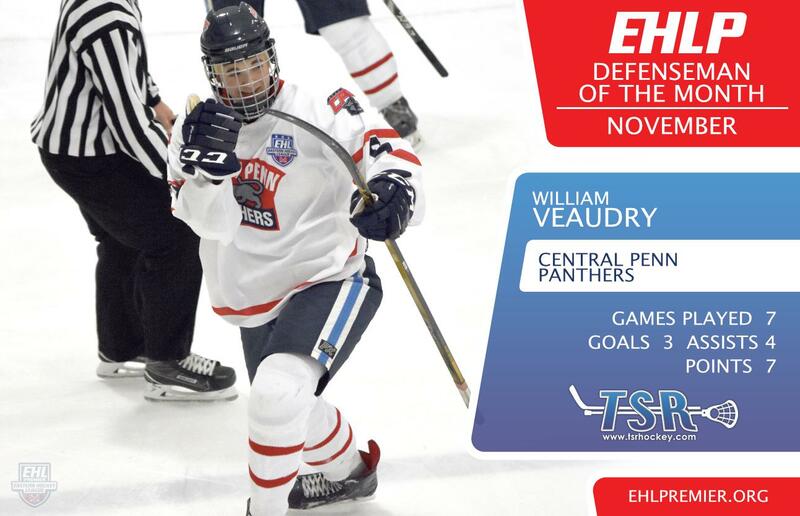 Looking back at November in the Eastern Hockey League Premier (EHLP), there was tons of great action amongst the 13 teams and numerous candidates for the latest set of TSR Hockey Stars of the Month. 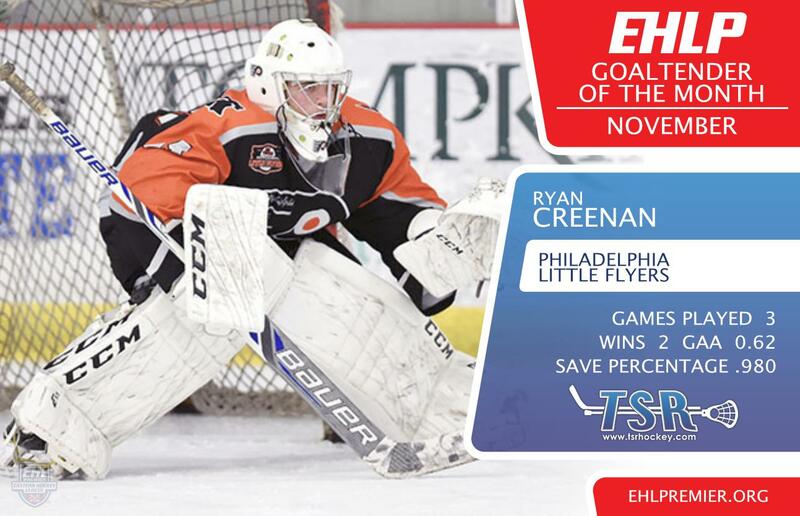 The EHLP is pleased to announce that DJ Sucher (Philadelphia Jr. Flyers), William Veaudry (Central Penn Panthers), and Ryan Creenan (Philadelphia Little Flyers) have been named the TSR Hockey Stars of the Month for November. Sucher led the EHLP in scoring, with 14 points during the month of November. The '98 put his name on the scoresheet in five of his team's seven games, all while averaging two points per game. Sucher is tied for the team lead in points with Matt Wood, as both scorers own identical stat lines through the first 21 games of the season (16 goals - 14 assists - 30 points). Sucher and the Jr. Flyers remain in control of the top spot in the South Conference with a record of 18-1-2, and will look to pad their lead with their next six games all against teams chasing them in the standings. There were a number of goalies that shined in November, but Ryan Creenan stood the tallest when manning the net for the Little Flyers. The '99 got the start in three games, posting a 2-0-1 record, and also came in for a perfect 19 minutes of relief. Overall the Little Flyers goaltender posted a stellar .062 GAA along with a .980 save percentage. For the season, Creenan is now 6-3-1 and owns a 2.45 GAA and .917 save percentage. Creenan will look to continue to anchor his team as they hit the ice for seven games in December, all against South Conference opponents.